In Genesis 2, Adam and Eve made a very crucial choice. It was a BAD choice. They chose to disobey God. When they sinned in the Garden of Eden it changed everything. 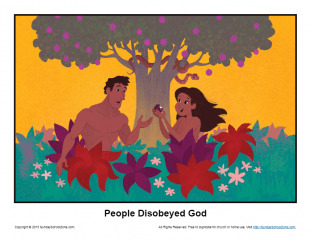 This People Disobeyed God Story Illustration will help kids understand that sin has very bad consequences. This story illustration can be used in a Sunday School, classroom or homeschool setting.